Born in Amuka - North Israel -, Hed Mayner started sewing at the age of 16, making his own patterns and garments. He studied at the Bezalel Academy of Arts and Design in Jerusalem, then moved to the Institut Français de la Mode in Paris to discover new aspects of fashion and craft enriching his aesthetics. Hed Mayner aims to inject the idea of spirituality, tradition, vulnerability, power and nobility in his work, as he is influenced by traditional Jewish orthodox tailoring and military outwear. Avoiding forced statements, Mayner's clothes are inviting and freeing, liberating men from uniforms and stereotypes. This season, Mayner pursued his exploration of unexpected sartorial encounters, twisting traditional tailoring with surprising fabrics and refined layering, using familiar styles but infusing them with a degree of abstraction that invites the eye to appreciate new textures. This willingness to surprise and to play with his audience illustrates Mayner’s generosity as a designer and his willingness to question our surroundings. Colors are either subdued or strong, from khaki and beige, to red and blue, as well as white and stark black. 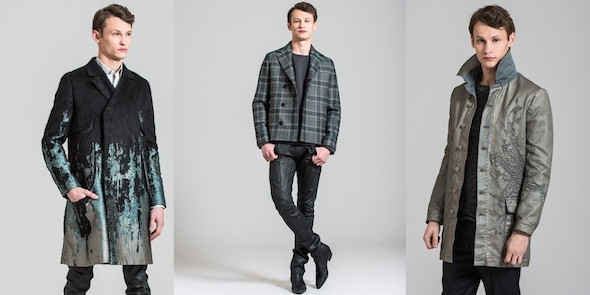 Fabrics range from felted wool and poplin, to soft velvet and stiff lambskin. The collection plays with the ideas of rich and poor, refined and ordinary. The silhouette is loose and uncontrived, which range from an architectural trench in stiff cotton with a rounded shoulder shape, to an elongated bomber in black nylon, whose back seems sculpted and curved, pants are low and full, denim is washed and distressed, to evoke the passage of time. The Rochas House, created in 1925 by Marcel Rochas then willed to his wife Hélène Rochas, recently named Beatrice Ferrant as its first menswear creative director. 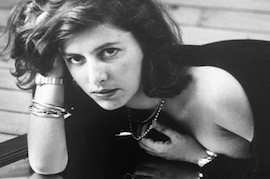 Graduated in 1989 from l’Ecole de la Chambre Syndicale de la Couture Parisienne, she worked for many prestigious couture houses such as Jean Patou and Balenciaga to name a few. In 2003 she founded her own brand Lefranc-Ferrant. As she drew inspiration from her male icons, such as Pierre Soulage, David Bowie, Prince, as well as Benjamin Millepieds, this image of a dancer was her main inspiration for this first collection. Equally suited to day and night, the wardrobe follows the movements of its wearer with ease and carries the Rochas signature: a neat cut for a sober and elegant style combined with refined details. For this inaugural A/W men’s collection she dared to mix materials from frothy tweeds to luminescent jacquard through hologramed silk and satin. Whether hidden or revealed, fibers are textured, pleated, embroidered, sprayed and sometimes coated or quilted. On some pieces the House’s initial appears in tone-on-tone embroidery on collars and cuffs. Baltic and turquin blues figure among the key shades, as well as chinese white, chalk and dove. Menthol and purple bring a cheerful touch to the season. Namacheko was founded in 2015 by Dilan and Lezan Lurr, the siblings of a Kurdish family. They moved to Sweden during their childhood. This juxtaposition of two society models enriched and inspired them for their very first collection. Therefore, they decided to create a collection inspired by their own quest for an identity as citizens from two countries. 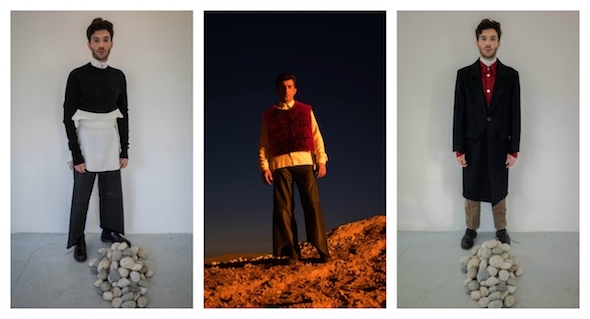 Named Serdem Nivar -Generation of the Now in Kurdish-, the collection is the result of the comparison between the designers as Kurdish and the designers as Swedish. They started with the notion of freedom and expression, but most importantly the ability to dream without limitation. The collection is as wearable as futuristic, but furthermore detains all of the creators' memories and are designed to create new ones to those who wear it. Dilan and Lezan have drawn their influence from different artists, mainly in the feminist art movement as well as in traditional Kurdish love songs from the 60s by artists like Merdan. They also got interested into Antonio Gaudi's work: the fluency of his lines are transcendent of surrealism, yet he has a tangible respect for the laws of nature surrounding them. Youjia Jin is a Chinese-born, London-based, fashion designer and fashion buyer, who graduated from the Beijing Institute of Fashion and Technology, from the Central Saint Martins College of Art and Design and from the London College of Fashion. Her graduation collections have been presented at the Beijing Fashion Week in 2009 as well as at the London Fashion Week in 2011. She believes it is crucial in the creative world to remain open to different influences and to try as much as possible to be versatile and non-restrictive. Following six womenswear seasons, it was time for her to launch a first menswear collection that develops the themes from the last womenswear collection. This male collection has been inspired by school uniforms and is named " Recreation "; the shorts and the jackets, the look and the style of our formative years. In that regard, the designer used elements which are traditionally seen on women, such as pleated and fluid fabrics, to create an androgynous feeling, as well as a constructed and wise look. School uniforms are well known to be uncomfortable, all synthetic fibers and static electricity, so by using more luxurious materials, mainly wool and silk, she aims to remind our childhood days. GmbH has been founded in May 2016 by Serhat Isik and Benjamin Alexander Huseby, the two creative directors of the brand, equally involved in the design and concepts. The name GmbH is the legal term of any corporation in Germany, equivalent to Inc. or Ltd. 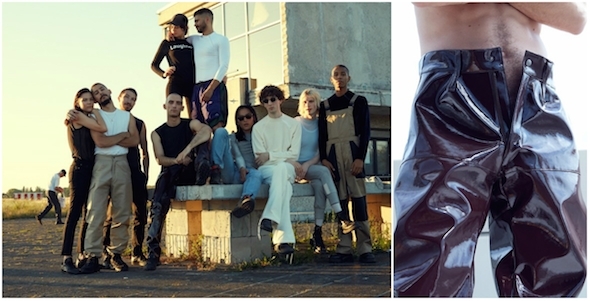 The brand functions as a collective, with many collaborators involving whole community of friends from Berlin’s international techno, art and fashion scene, such as Danish-Korean music producer Whybe, Austrian-Turkish DJ Cem and designer Stefano Pilati to name a few. Isik -28- is a German-Turkish designer living in Berlin. He worked 3 years as a designer at Bless, as well as freelancing and consulting for several designers. He closed his own eponymous label after his debut collection was stolen from the showroom in 2015. Huseby -36- is a Norwegian-Pakistani photographer and artist who worked for many firms -The Gentlewoman, Dazed, W, Prada, Lanvin, Adidas and many more- as well as exhibiting worldwide -NYC, London and Berlin Art Biennale-. He studied fine art at Chelsea College of Art and The Royal Art Academy in Oslo. The designers are both children of Muslim immigrants and in the current polarizing socio-political climate, they believe representation in both fashion and culture as a whole, of a multicultural society, as well as positive images of youth with immigrant backgrounds are essential to nurture progressive change. Selfmade is a project born from Gianfranco Villegas, a young Filipino-Italian designer. The name of the brand takes its roots from the designer’s childhood, growing up alone with his mother in Florence. He began to work to satisfy his huge passion for fashion at the age of 14, eventually he graduated in 2013 from the prestigious Polimoda Fashion School in Florence. Every piece in the collection is hand-crafted in Tuscany with premium materials. He mainly worked on trying to change some streetwear key-pieces, like bombers or raincoats, into more tailored luxurious pieces, by using precious materials like cashmere, mohair, leather and virgin wool, as well as adding that strong streetwear feeling, typical of the brand, to some tailored pieces like classical long coats, by using visible zips and raw cuts. The Selfmade’s signature of hand-embroidered 3D graphics is applied in silk threads using a technique unique to the brand. The graphics on the garments are “romantic” tags and sentences made out of an old hand sewing embroidery machine. The tags are inspired by some works of contemporary artists like Antony Micallef and Muntean/Rosenblum as well as of 2pac’s lyrics. It has been described by Ginza and High Snobiety as one of the hottest upcoming brands.